How do you put jigsaw puzzles together? Learn how to assemble jigsaw puzzles faster and with less effort. Everyone has their own way of putting a jigsaw puzzle together. But sometimes we get frustrated or stuck and want to give up. It's a natural to get upset or want to take a break. But rest assured there are tricks of the trade that make assembling these tests of wit more simple. 1. Pick A Spot To Work On Your Puzzle: A large flat surface out of the way is a good place. Make sure whatever you use is large enough to accommodate the puzzle and extra room to ensure you don't lose any pieces. Nobody wants to spend all that time putting a puzzle together only to find out pieces are missing. If pieces are missing and your sure you didn't misplace them check out our Missing Jigsaw Puzzle Pieces page and we'll get you in touch with the manufacturer of that puzzle. 2. 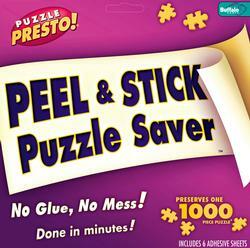 Open Your Puzzle Box And Carefully Remove Any Pieces That Are Stuck Together: Sometimes puzzle pieces are stuck together when removing them from the sealed bag. Just be sure not to damage any connecting ends. This can ruin the look of the puzzle. 3. Look For The Edge Pieces: Assuming of coarse it's a square or rectangular puzzle. Find all the edges and begin putting them together until you have a complete border. This makes the puzzle much easier to assemble when the outlying pieces are together. 4. Sort The Remaining Pieces Either By Color Or Tabs And Blanks: By sorting the remaining pieces, you can look at the picture on the box and look for color patterns or distinguishing features. 5. Once The Puzzles Completed, It's Time To Decide What To Do With It: You really only have 2 options at this point. You can either take the completed puzzle apart, or you can glue and frame it. If you choose to break it down, do so and store your box away from the elements to ensure future enjoyment. If your going down the route of gluing and framing your puzzle move on to the next step. 6. How To Glue A Jigsaw Puzzle: It's pretty straight forward. 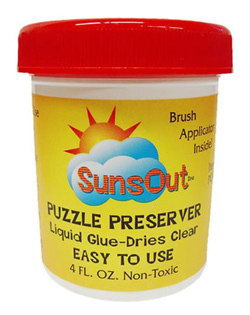 First, buy puzzle glue assuming you don't already have some. We have several brands and types available to fit any budget and project. 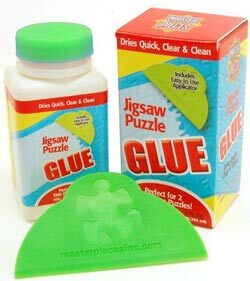 For steps and procedures on this check out our how to glue a jigsaw puzzle page. 7. Framing Your Jigsaw Puzzle: Your only limited by your imagination. If you want to use a high quality stained oak frame to display your puzzle for all to see above your mantle, go for it. Let your creativity flow freely. If you need to see steps for framing a jigsaw puzzle we have a fully detailed page of the entire process.